Bulk material is carefully metered into a weigh hopper (i.e. net weighed) using two-speed (bulk / dribble) flow control. 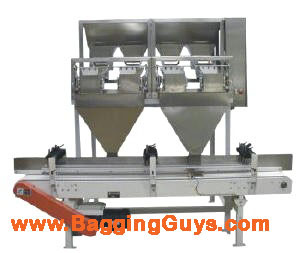 Then, the precisely weighed material is dumped directly into your container. An automatic, conveyorized indexing system moves the filled container out of the filling position and replaces it with an empty container.